Drone registrations are soaring. As noted by Fortune, more than 670,000 people have registered drones with the FAA over the last year, while massive retail companies like Amazon are testing out drone-based delivery services to help avoid increasing roadway congestion. Unmanned aerial vehicles (UAVs) play a role in modern mobile surveillance. From use on the battlefield to everyday operations such as monitoring construction sites and car dealerships, this technology has come a long way. Here’s a look at the history, evolution and emerging use cases for drones. Who Invented Drones (and Why)? Two goals formed the foundation of drone development: scientific curiosity and the potential to avoid loss-of-life in warfare. On the scientific side of the spectrum was Nikola Tesla, who deployed a small, unmanned boat in 1898 at Madison Square Garden which was controlled via radio signals. Think of it as a precursor to aerial drones with the capability to take commands but unable to achieve liftoff. When it comes to warfare, meanwhile, the Austrians launched unmanned balloons filled with explosives to attack Venice on August 22nd, 1849. While some of these balloons did reach their intended targets, others were blown back over enemy lines. In this case, the vehicles were airborne but not reliable enough to control their explosives, so the Austrians were at the mercy of fair-weather winds. By 1931, the British military developed a radio-controlled plane called the “DH.82B Queen Bee,” which could travel up to 300 miles at 108 miles per hour and was used for target practice. The term “drone” is said to come from this aircraft, and became the basic standard of future UAVs: They must be airborne, unmanned and remotely controlled. The Flying Bomb — Also known as the “Kettering Bug,” this was little more than a missile taped to cardboard wings with a 40-horsepower engine, which was designed by the United States during World War I. Although successful, it wasn’t finished in time to fight the war. The Radioplane — Created by Reginald Denny, 15,000 of these radio-controlled drones were sold to the American military for anti-aircraft target practice. The Fritz X — Near the end of WWII, the Germans developed this 2,300 pound, radio-controlled bomb. It was the first remote-operated munitions device used in wartime. The Lightning Bug — Used in the 1960s, the Lightning Bug 147SC could travel 600 miles at nearly 600 miles per hour and performed surveillance on Vietnam, China and Korea during this period. The Predator — Developed in 1995, the General Atomics MQ-1 Predator could deploy Hellfire missiles with devastating accuracy. This and later models or the Predator became the face of military UAVs in the late 1990s and early 2000s. As the size and cost of electronic components reduced, the use case for drones expanded. As noted by Visual Capitalist, new drone technology includes motion tracking sensors, solar-power cells, thermal scanning and 3D mapping all backed by robust Wi-Fi connections. So it’s no surprise that in 2010 a consumer drone was released — the Parrot AR — which has spawned a host of imitators, innovations, and improvements over the last seven years. In 2013, Amazon CEO Jeff Bezos announced plans to have his company deliver packages by air. While he’s run into difficulties with the FAA, the project remains in development. Mobile surveillance is another growth area for drones. Given their lighter weight and increased battery life combined with the reduced size and weight of Wi-Fi cameras, it’s now possible to leverage drones as reliable, real-time security and project surveillance for construction projects, parking lots and car dealerships. 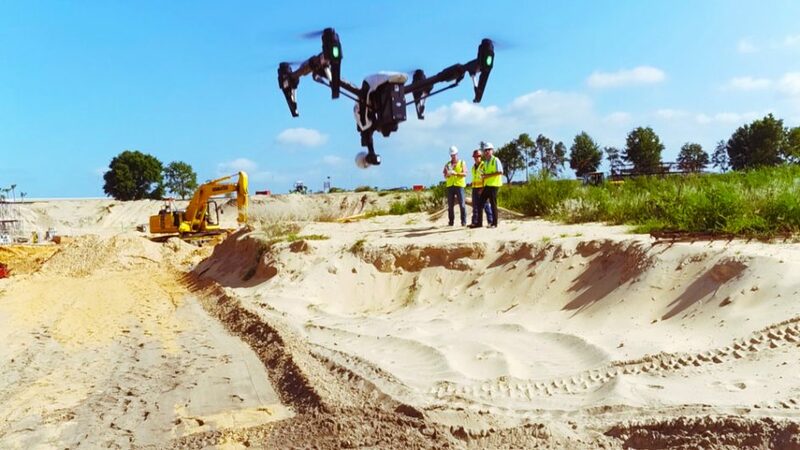 Instead of relying on fixed cameras with limited fields of vision, drones can quickly survey any part of a construction site or parking lot. Add in 3D site-mapping to create jobsite documentation and project milestone records, or thermal imaging to help track down suspicious activity in parking lots after-hours. Drone services have evolved from scientific curiosity to wartime mainstay to consumer and commercial products. While hobbyists continue to register with the FAA and the military develops new unmanned technology, the evolution of mobile surveillance drones makes them cost-effective, high-impact solutions to improve commercial security and oversight.